My Dog Hates The Vacuum! Big, loud, scary, moving- you can’t seem to blame Fido for having it out for the dirt devil. We know there is nothing to be afraid of but Fido needs to learn it’s harmless. 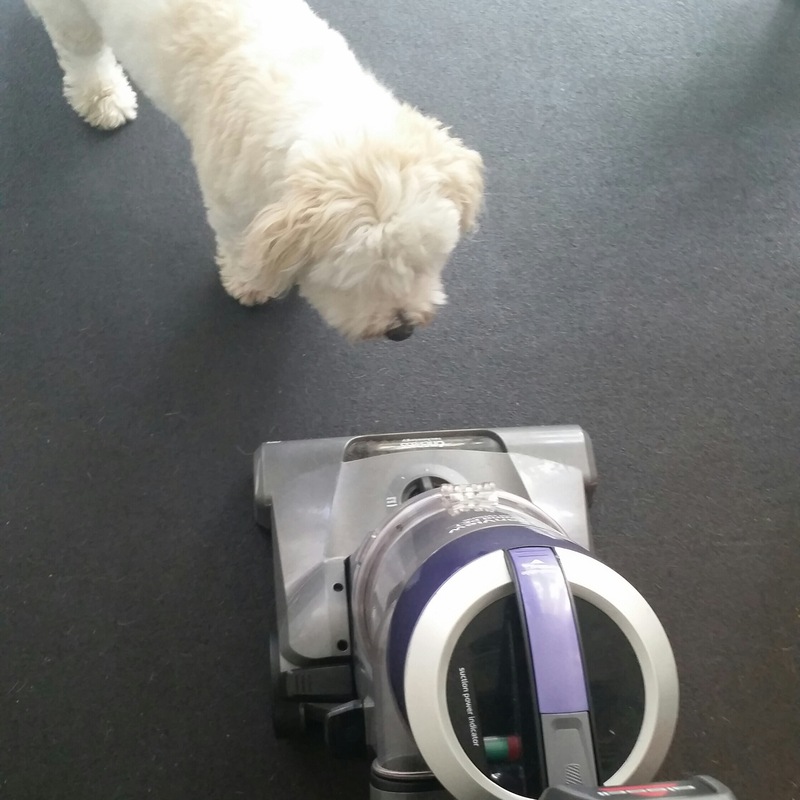 We want to start to slowly desensitize Fido to the vacuum. This process will progress at different rates for different dogs. As with any training we need to be patient and move at a rate that’s comfortable for your pup. We do not want to progress to the next step until we see that our pup is 100% comfortable. Step 1: A couple times a day, bring out the vacuum and simply leave it out. Place some treats from a distance all the way up to the vacuum and finally some on the actual vacuum itself. Be sure to praise Fido for calm behavior and for simply tolerating the vacuum with ease.Depending on your pup, do this a couple times a day for a few days until you are sure he is ready to move on. Step 2: Just like step one, bring the vacuum out but this time you are going to add movement to the vacuum. With the vacuum off, slowly act as if you are vacuuming. Be in tune to your dog’s body language and praise him anytime you see him notice the vacuum and ignore it. Always end on a high note, so if you see him completely ignoring the movement of the vacuum after noticing it-praise and end session. As with any of these steps, if you see reactive behavior occurring during training, take it back a couple steps. Step 3: With the vacuum out and upright, turn the power on momentarily then off. Quickly praise your pup with treats and lots of loving. Gradually increase the amount of time the vacuum is on and continue to praise. Step 4: Once your pup has become comfortable with the noise we are once again going to add movement. You may literally have to work in ½ inch increments depending on the reactiveness of your pup. As mentioned before, be in tune to your pup and always stop while you’re ahead. Any progress is good progress! These “sessions” can range from 10 seconds to a few minutes. Short and sweet. Once you pass step one you can leave the vacuum out during the day so your pup gets used to it more and it becomes less foreign to them. You’ll be amazed by your pups transformation if you are willing to give this a try. One day you will be thinking back to the time when your doggie was sworn enemies with the dirt devil. Hope this helps, happy cleaning! After every training session I always finish with the phrase ” be consistent”. There is a reason for my consistent need to be consistent! If you practice behaviors with your dog regularly and our repetitious it is amazing the level of obedience and sense of achievement you and your dog receive. Same goes for potty training. Taking your dog out at the same time everyday gets your dog on a routine and they are able to anticipate their walk and hold in their urine till the great moment they get to go for a walk. I tell my clients ” there is no day off in training”. Your dog loves to learn and even if you are only able to do something with them for 5 mins that five minute session makes all the difference. To Neuter or Not to Neuter that is the Question? Many people have different philosophies on dog neutering, pros and cons. However, there are overwhelming reasons to neuter your dog then to keep them “intact”. If you want to breed your dog, of course, neutering is not an option. Other than that reason neutering should be on your to do list ( earliest 6 months). Problems that may develop with unneutered dogs. 1) Adult marking and spraying: Does your dog have accidents in the house every once in a while? This can be due to male marking, small urine marks that pop on on vertical objects or on personal property ( bedding, couch). Male marking is not an easy fix and can not be treated the same way as house breaking. It is a horrid pain to clean and a problem that breeders put up with. 2) Undesired behaviors: many unneutered dogs can develop unwanted behaviors that are basic urges and thus hard to control . The tendencies for male dogs to be aggressive to other males or sexual to females in heat is greater . This makes dog park visits and attending doggie day cares limited or in some cases an added expense. In addition behavioral issues at an earlier age can be considered intensified if the dog is not neutered. Hyperactivity and signs of dominance may also start developing. This may develop into reactivity as an adult . When it comes to your dogs big moment for the “snip snip” (if you are not breeding ) remember the old price is right saying: ” don’t forget to spade and neuter you pets”. How to fix undesired dog behaviors! I love my clients because they inspire me everyday to write informational posts and blogs. Today we are focusing on energy and observation! Dogs can have predictable behavior meaning in some cases you can actually anticipate poor or undesired behavior with your dog. If you notice that during the day your dog is an angel he sleeps, nice and calm but when the family comes home in the afternoon your dog goes “wild”. Sound familiar. 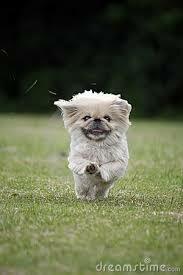 The interesting thing is people think ” ahh my dog is out if control. He jumps on sofa, he chases the children he has started biting the carpet or rug.” But they are not out of control they are channeling their energy poorly and inefficiently. If this sounds like your family situation . There is a simple solution. Before you get frustrated with your puppy or dog, ask why does this happen. Your dog has to much energy!!! A bored dog, a well rested dog, or a dog awaiting and anticipating your arrival will be destructive. However if you can realize this you can solve this problem. Reinforce your dog during the day for being calm then before the family comes home take your dog for a run or to the dog park. Burn off that energy. Remember a TIRED DOG is a GOOD DOG!!!!!!! Then come home and be behavioral . Your dog will now have far less energy, and now you can really work on training. As people come through the door ask your dog to sit reinforce them for not rushing the door or for not jumping . Really show your dog what you want by reinforcing the calm behavior. Another alternative to channel that energy positively is my applying training techniques. If you can do a training session with your dog everyday this will help your dog burn energy, think for themselves and occupy their time. It doesn’t have to be complex , start with sits and downs stays and comes. Start playing fetch where your dog receives objects ,comes back to control , and releases objects! They get exercise and they are learning critical training techniques. This system works!! Just like children, dogs need attention, playtime outside to run around and schooling. Could you imagine if you didn’t do this with your children !! Your house could look worse then how your dog leaves it now! So appreciate your pup and know to observe your dog and efficiently get rid of the excess energy. Best places on Key Biscayne to have animals! Animals are great but not all apartment and condos are as enthusiastic to allow animals. Many high rises on Key Biscayne allow only dogs 20 pounds and under, only one dog per condo, only owners can have pets or the worst no pets at all! So with such restrictions where on this island can you possible go with your furry family besides million dollar homes. Here is my list of the top 4 most PET FRIENDLY places to live on Key Biscayne. 1) Le Phare: Hands down, this small townhouse community has it all if you are an animal enthusiast. Renters and owners alike can have pets of any size and any quantity.! It is easy to walk your dog since there is street access with several doggy poo bag stations for quick pick ups. They also have grassy courtyards for your doggies. Another pro is that you are just 4 blocks from the new KB Dog Park. 2). Key Colony: Now Key Colony does have restrictions on weight of dog and rules on only owners being able to own a dog but if you can meet this requirements Key Colony has their own private dog park and tons of stimulating dog paths that can really keep your dog enjoying their walks . Key colony is also across the street from a vet and grooming store. 3) Galen and sunrise: (DISCLAIMER) not every building down these streets allow dogs so do your research however most do. These streets are friendly , dogs have easy access to the outside with many doggy poo stations for quick pick ups and across the street from the Dog Park!! Most buildings do have the 20 pound and under rule but many buildings are lenient. 4) Commodore Club : Like most places on the Key there is a weight limit and amount limit to the number of dogs one can have however there are many dog owners and they have a private dog run next to Crandon park that is great for dogs to run around and release that extra energy! I believe growing up with animals really helps a family grow with responsibility, love, affection and knowledge. As the Key is becoming a family oriented community I hope these growing families that live in condos can also have the pleasure of animals in their lives.